MainAll NewsJewish WorldWho Controls Vandalized Mount of Olives? Who Controls Vandalized Mount of Olives? 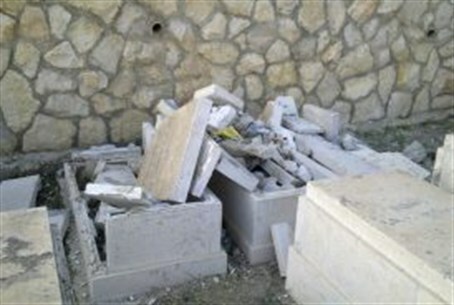 Jerusalem Arabs destroyed a dozen graves at the Mount of Olives cemetery, supposedly under Israeli sovereignty. Jerusalem Arabs destroyed a dozen graves at the Mount of Olives (Har Hazeitim) cemetery, supposedly under Israeli sovereignty and where many revered rabbis and Torah scholars are buried. The damage was discovered at the part of the cemetery near a predominantly neighborhood where Jews have begun to return the past two decades. Itamar Oren of Karnei Shomron, located in central Samaria, told Arutz Sheva he arrived at the cemetery last Thursday for a memorial service and was shocked to see the broken gravestones, on which the vandals threw rubbish. He said 12 of 20 Jewish graves in the area were damaged or destroyed. Oren’s photographic evidence of the vandalism is seen below. He said he did not file a complaint to the police because law enforcement authorities are thoroughly aware of the anarchy on the Mount of Olives and that there is no sense in filing another complaint.